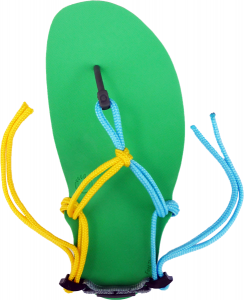 Like the lacing system in our Amuri barefoot sandals? 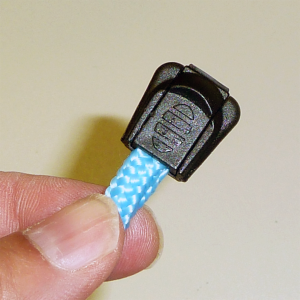 Add the Amuri Lacing System to your DIY Xero Shoes for only $6.99. Turn your Xero Shoes Do-It-Yourself kit into a “hybrid Amuri Venture” with this hardware kit. This is all the hardware we use for the Cloud and Venture sandals. SAVE by getting the Complete Kit, rather than the individual components. 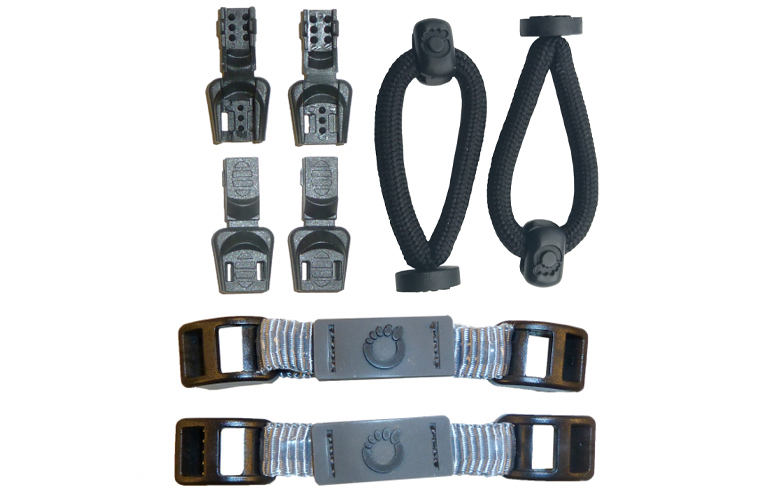 While the photos, below, show the components in various colors, the hardware is all Black and the Heel Straps have a silver/gray webbing and black hardware. 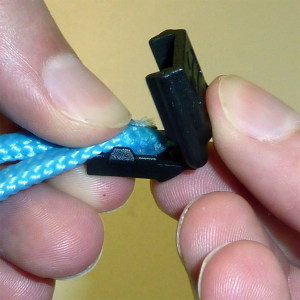 Well, the bottom of the Toe Post isn’t much bigger than the knot you make for your DIY kit, so you shouldn’t. If you do feel it, feel free to experiment with trimming or sanding it down just a bit at a time to get the feeling you want. a) Here’s the basic lacing pattern. I’ve trimmed the laces in advance so you can see the ends. Don’t trim them yet. b) Thread the laces through the Heel Strap hardware, as shown. d) Press the lace end sections together until they “click” and lock. You may want to use a pliers to help with this step. e) Here’s a completed Lace End. Tough to install on 6mm, but worth the effort. I could never get my DIY FeelTrue sandals to fit quite right. I wore a 4mm pair out, then got a 6mm pair, and I could always get them to not slap, or get the top knot to not hurt my feet on the 6mm. I was reminded of this kit, and decided to go for it. It changed my world. If I have any problems with the fit, it's much easier to fix it. I don't feel the plastic bead under my foot, either, because the sandal stays in JUST the right spot. I will probably be buying a second DIY kit in 4mm and a hardware kit because this kit is so good. 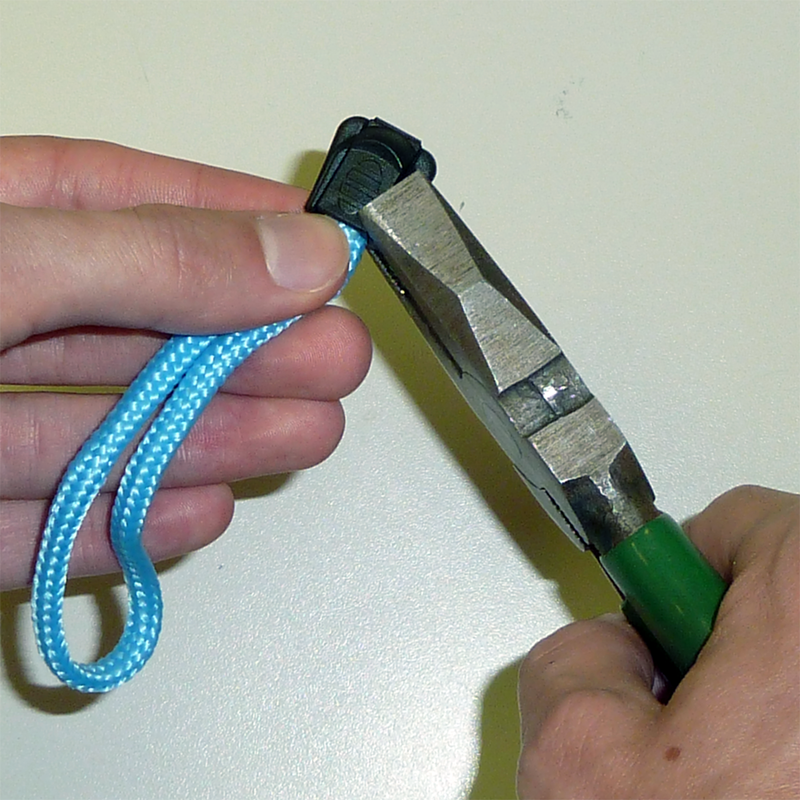 A tip: To install these, it would help to have a good-sized drill bit, or thread the run the first lace through the toe strap, the lace through the sandal hole, and yank the bead through by the lace. 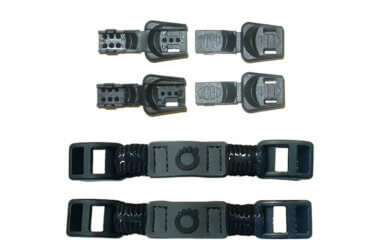 This kit added an extra level of comfort and convenience to my Xero sandal kit. Well worth the $6 and the online instructions are easy to follow. Still working on the perfect adjustment but that is understandable. Easier to adjust, fits better! First, a little background. 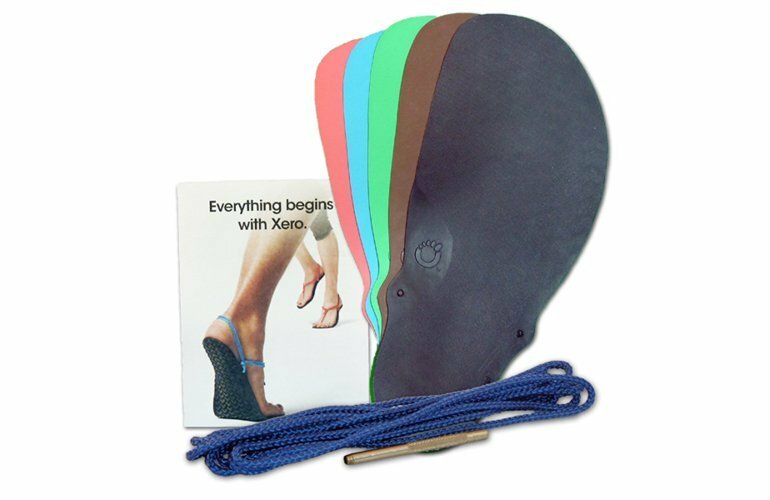 I'm an early adopter of Xero Shoes, I bought my first DIY 4mm Connect Kit in August 2011 when the company was still named Invisible Shoes. I'm a former Boy Scout, a former US Navy sailor, a current Scoutmaster, a current member of the International Guild of Knot Tyers (yes, such a thing really exists), and I am NOT knot challenged. 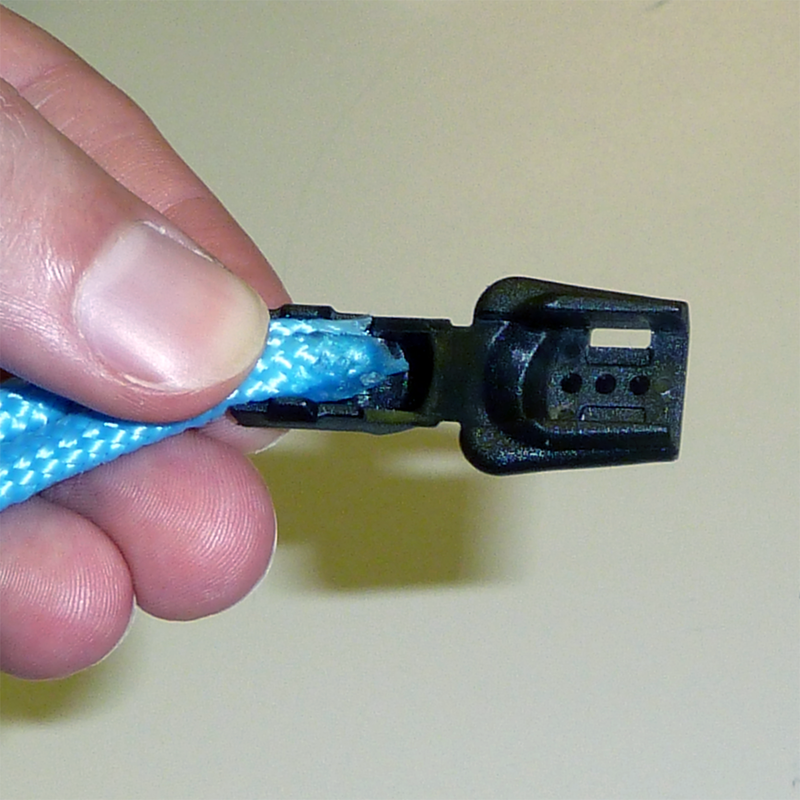 Over the last five years, I have tried many different lacing systems on my Xero Shoes, and discovered 4 things: 1) I put a lot of miles on my Xero Shoes, and the toe strap knots wear out often, requiring frequently relacing the sandals. 2) My heels don't project to the rear very far, making the correct tension on the heel strap critical to keeping the strap up. 3) My feet change size throughout the day. If I adjust the shoes to fit in the morning, they're too tight in the afternoon. If I adjust the shoes in the afternoon, they're too loose in the morning. 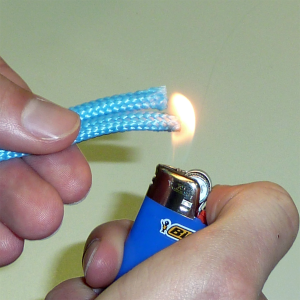 4) While I know lots of knots, I've not been able to come up with a lacing system that balances security and comfort, AND is easy to adjust. This brings us to the review, I bought two of the Amuri Hardware Kit - Complete and retrofitted two pair of my Xero Shoes DIY Kits (1 pair 4mm Connect, 1 pair 6mm Contact). Best purchase ever. 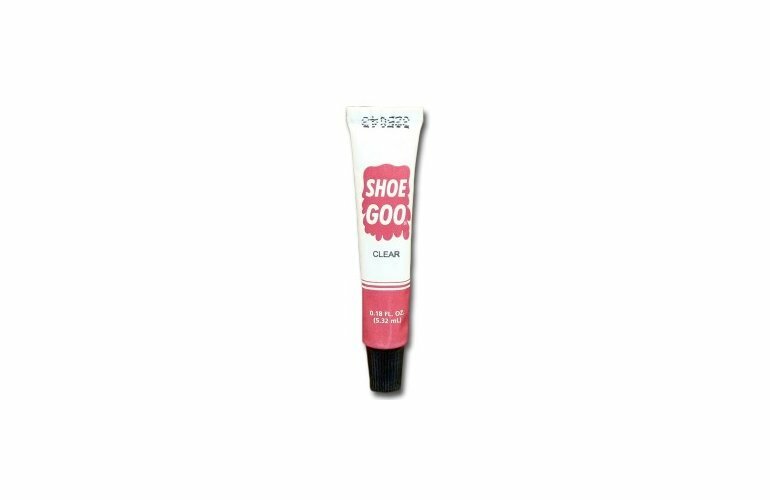 Easy to install, easy to adjust, and that little bead of silicone on the heel strap provides just enough friction to help keep the heel strap up without having to adjusted them as tightly. I will be retrofitting my other DIY Kits soon. If you own any of Xero Shoes DIY Kits, do yourself a favor and get this kit! Well worth the extra expense! I bought the DIY kit a few months ago and have quite enjoyed the fit and comfort of the huaraches. What I haven't completely liked, however, is that the front knot in the lace (that faces the ground) wears out and that adjusting the laces for fit is a bit of a to-do. I wore out a knot in about 3 months (it broke during a run, too), which isn't horrible, since the laces are cheap, but then I had to deal with the second part - pulling apart and relacing the huaraches. I'm not sure if it's just because I was failure as a Boy Scout that I have some serious difficulty with lacing, but I find the process tedious and time-consuming. When I relaced, I put about 20 - 30 minutes into each huarache. After all that, it turned out that I laced one of them too tightly and got a nice blood blister between my toes on the next run. I was able to adjust the fit again, but my knot-challenge turned that into a long process. After the blister, I figured that I should get some more laces. While I was here, I thought I'd look at what else Xero Shoes offers for the DIY kit. For the price, I thought the Amuri kit was worth a shot. Putting the huaraches together was dirt-simple. Even I could do it. I will recommend a pair of pliers to hold the Lacing Tool, but other than that, installation was a snap. The toe post is pretty comfortable. It is a touch thicker than a lace, so it will take a bit of getting used to (for me, about 15 minutes worth of walking). The back strap is also quite comfortable. It will get caught on a pant leg a little more than straight laces, but it also sticks to the skin better, so it's kind of a wash. Where the Amuri kit really shines, however, is the adjustability of the huaraches. There are only four adjustment points in the entire huarache, as compared with many more with a standard lacing. If the fit isn't right, you can change that easily, even while you're out on a run. I really appreciated that. I have a strong preference for the 4 mm sole in the DIY kit so that I can get a good ground feel. Further, I don't really like the look of the heel cup on the Amuri sandals themselves. Frankly, I haven't tried them, so maybe it's not a big deal. My personal preference, however, is for as little interaction with the sole as possible, so I'm glad that Xero Shoes offers this kit so that I can upgrade a DIY kit. I plan to get another pair for trail running when the snow goes away. I will definitely buy another Amuri kit at that time. I recommend this kit wholeheartedly. I bought th DIY kit, but always had problems with the laces. With this kit i feel the freedom since i installed it.